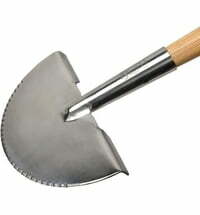 With its slim shape, this trowel is particularly suitable for working in densely vegetated areas. Thanks to the engraved measurements on the blade, you always know how deep you've dug - which is particularly useful when you're planting bulbs. Thanks to the stainless steel construction, rust has no chance and transplanter still looks lovely years later. The special alloy and the ergonomic shape ensure that the blade is particularly sturdy and fits perfectly in the hand. This shovel is recommended by the Royal Horticultural Society and thus meets the highest quality standards.